Cara cost effective untuk Anda yang memiliki Oracle DB Standard dan ingin menjalankan replikasi , bisa gunakan DBVisit. Anda tidak harus migrasi ke Oracle DB Enterprise untuk mendapatkan Data Guard. Investasi akan lebih murah, dengan mempertahankan Oracle DB Standard dan membeli DBVisit. Perhitungan licensenya pun mudah. Tinggal memilih, DBVisit Standby atau DBVisit Replicate. Dbvisit Product Comparison: Standby or Replicate? Enables replication between different Oracle versions and operating systems, and the target database can be non Oracle (SQL Server and MySQL). (+) Click image to expand. Download this overview as a PDF HERE. Physical replication is a binary copy of the primary or source database. Changes are applied at the lowest level available within the DBMS, ensuring that the target or standby database is an exact replica of the primary database, including all internal database indexes, pointers and tables. A logical replicated database is an independent database that is kept in sync by a replication mechanism that applies updates at the logical level (e.g. via SQL statements). This means that while the data within a logical target database may be the same as that in the primary or source database, the internal database-level structures will be different. This may have implications for some applications, and for the usage of the logical replicated database in the event of a failure. This is important as the database must be viewed not only as a repository of application data, but also a container with its own management and administrative data. For example, if a password is changed in the source database it is not updated in the target, then when it comes to failover the system will not work because of an old password. It also means that, although internal linkages that support referential integrity may be in place in the standby database, these may be physically different than at the primary site, and as a result, may have an impact on the application (e.g. different automatically created foreign key values). Physical replication is all or nothing. Either 100% of the database is replicated or nothing at all. With logical replication it is possible to only replicate a subset of the database in the database (100% replication is also possible). Physical replication is analogous with using a tool such as rsync to synchronize Word document, with rsync replicating the file at the binary file level. A logical standby database is analogous with manually updating a Word document by scanning for changes in the source file and copying them to the right location within the standby file. Salah satu hal yang harus dikontrol dalam manajemen password perusahaan adalah permintaan password dari user. Password Manager Pro membantu proses ini. After successful authentication into Password Manager Pro, users get access to the passwords that are owned by them or shared to them. While storing very sensitive passwords, quite often administrators wish to have an extra level of security. In some other cases, administrators wish to give temporary access to passwords for certain users for a specified period of time. There are also requirements to give users exclusive privilege to passwords. That means, only one user should be allowed to use a particular password at any point of time. When more than one user is required to work on the same resource, problems of coordination arise. Access control on concurrent usage would help resolve such issues. 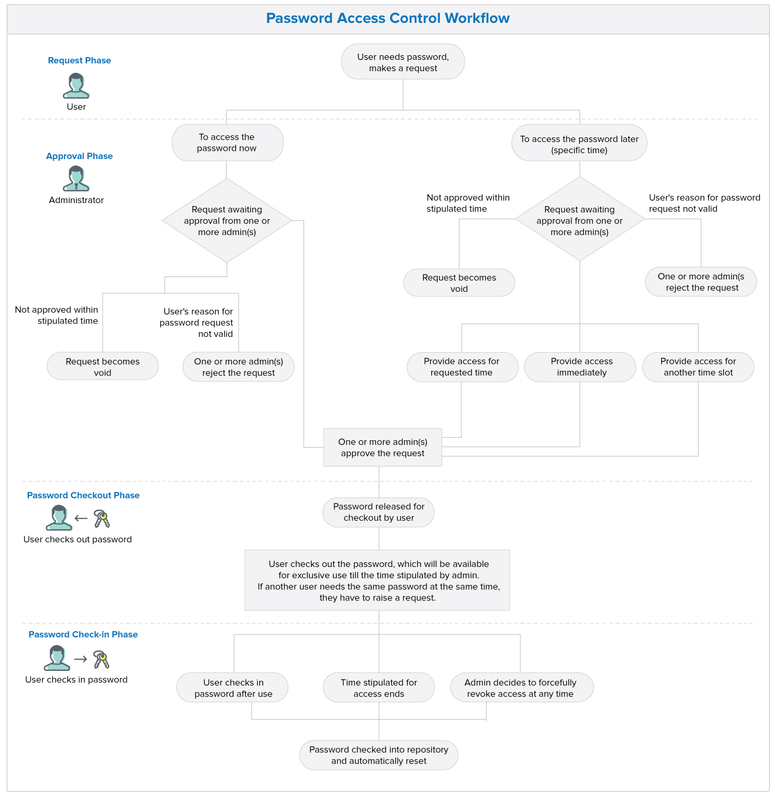 To achieve all the above requirements, PMP provides the Password Access Control Workflow. How does password access control work? While giving the exclusive access to a user temporarily, PMP provides the flexibility to enable administrators view the password concurrently. Through a simple administrative setting from “General Settings”, users will be able to do that, if required. Humans and computers have collectively been generating data for last many decades and the data has become an integrated part of every organization-be it small or big. As the importance and value of data increases for an organization so does the burgeoning of silos within the enterprise. Big data is a combination of transactional data and unstructured data. While technologies have been maturing to handle the volumes of transactional data, it is the unstructured data which is being generated from various sources of interactions adding complexity to the overall picture. Till now technologies have helped mastering the art of managing volumes of transaction data but it is the non-transactional data that is adding heterogeneity and momentum attributes to the ever-growing data pool and pose significant deciphering and analysis challenges to the enterprises. With the ubiquity of modern and social technologies riding on the Internet, conventional businesses are dramatically converting to digital resulting into the big bang of data. The source of data for the enterprises are no longer constricted to corporate data warehouses but are available outside the perimeters of the organization. From the sciences to healthcare, from banking to Internet, the sectors may be diverse yet together they tell a similar story: The amount of data in the world is growing fast outrunning not machines but our imaginations. The insurance industry too is no different than any other business with respect to its struggle to get a good handle on its data for decades, both on the transactional and the risk management sides. Many insurers have embraced analytics and have treaded at leveraging data and analytics to solve basic distribution and pricing issues. However, the industry has largely ignored opportunities to increase customer engagement and loyalty and have missed learnings from other sectors that have successfully leveraged on analytics to drive the revenues upside in this context. Despite having the lowest insurance penetration in the country, the companies are fiercely competing with each other and are targeting for a finite pool of customers. Growth strategies are framed on the basis of the ability to eat an existing pie of customer base from competition. A valid reason could be the skewed demographics of the country and the population which can afford to have a compulsion to buy insurance for protection of life and assets. Companies have been spending time and efforts to come out with better products and pricing to attract customers on the basis of their own experiences and competition benchmarking. Distribution model for companies too are getting diverse ranging from conventional adviser channels, banks, brokers, and online. Today consumers understand what products they need so they can purchase those products on their own without taking any advice from professionals. Also, the process of buying insurance is much easier now than even a decade ago, as web and mobility-based sales are vaulting up. Having said that it becomes inevitable for companies to extract more value out of the data generated from these complex and diverse interactions with customers and partners. Global insurance carriers are experimenting and exploiting the big data and various use cases are emerging out showcasing the exponential value which it is bringing for the companies to better understand customers and resonate with them. In the earlier world of insurance, distribution agents knew their customers and communities personally and were closely acquainted with inherent risks of offering different type of insurance to customers. Today, relationships have become decentralized and virtual. Insurers can access and leverage upon the massive data being generated from these virtual channels and quantify risks and build behavioral models based on customer profiles cross referencing with specific type of products, eg, risks can be identified on the basis of demographics, employment statistics, etc. Using analytical techniques such as pattern analysis and insights from social media, companies are now doing a better job of fraud detection. Example, analyzing the behavior of a beneficiary across similar type claims submitted by the same person and extend this to the social graph of the person to look at similar activities amongst connected individuals to derive a network of fraudulent people instead of an individual. With the enormous data available across multiple channels of business including website clicks, social media, core transactional data, interactions with call center, emails, portals, agent reports, and various other sources it is becoming possible to get a holistic and 360 degree view of the customers. This can help insurers increase and cross sell various products and personalized services based on the needs and budgets of the customers. Companies have taken further steps ahead by analyzing the unstructured data from social media and speech analytics from call centers conversations to improve their sentiment analysis and achieve better brand value and gain competitive advantage. This is further helping in increase of customer satisfaction, revenue per customer or a household and better NPS scores for the companies. Until recent times insurers have been coming out with standard pricing for automobile policies based on conventional actuarial models considering variables such as vehicle type, driver age and location but there were no methods to assess risks by looking at individuals driving patterns. With the telematics data basis, it is now possible to get a direct insight on driving patterns of customers and thus helping the companies to reduce premiums for safe drivers. This data can further help in accessing the claims in case of an accident by correlating with third party traffic and weather data. Another interesting use case of utilization of social media to introduce product offerings and services is emerging where insurers are moving themselves away from conventional marketing campaigns such as television and print media instead they are choosing social media for targeting specific customer segments and on the basis the success upgrade to broader markets and segments of prospective customers. Additionally Social networking data can be mined to determine which customers have the most influence over others within social networks; this helps companies determine which are their most important and influential customers. Overall, there is more than enough evidence to demonstrate that the big data approach is a potential game changer in the insurance industry. Insurers, regardless of size, specialty, or location, should explore the possibilities, keeping in mind the impact of big data. Audit keamanan jaringan dan sistem Anda dgn SecurityManager Plus. Reports are essential to provide insights on historical data, trends and to facilitate statistical analysis of network behavior. They are useful when security administrators have to submit periodic information on the security posture of the network to IT managers and auditors to make well-informed security decisions. Reports also ensure that the company's IT and regulatory policies are complied with. Security Manager Plus comes with a set of comprehensive, canned reports to aid security administrators. There are also provisions to define custom reports based on select criteria. Reports can also be generated on vulnerability scan completion and sent to desired e-mail IDs. They can be exported to PDF or CSV format and can be imported by other reporting tools like Crystal Reports etc. Security Consultants and Service Providers have the facility to rebrand reports from Security Manager Plus by changing the company logo and disclaimer messages. Some of the reports in Security Manager Plus are shown below for reference. Provides a detailed listing of all the missing service packs and patches on the selected assets. Data center management is becoming more difficult, traditional tools and methods are just not enough for organizations to keep up with current job complexity and demands. Organizations have many challenges in ensuring that the company is getting all the requirement support in IT, and networking. Some of these challenges are opposites that require organization to improve services on one hand while reducing costs on the other. This is a task that on the surface would seem to be impossible to achieve, especially in the increasingly demanding environment of a data center. At a minimum just finding a reasonable balance between the following objectives is difficult enough. The data center operation manager requires an effective process system to manage capacity (space, power, and connections), assets and change; and then one needs a tool that will help them manage the difficulties in data center. Without an effective way to monitor and report energy, power, and critical environmental information, a tool becomes necessary to help organization to manage these functions. What is needed and is now available are the proper tools that will provide the visibility, control, and insight to better manage capacity and energy in an integrated way that will maximize data center efficiency. Most day-to-day data center operational problems can be broken down into six key functional areas to manage; capacity, asset, change, energy, environment, and power. These functional areas have their own set of individual management problems and questions that IT managers deal with every day. With increased data center demands and complexity there is a growing need to better understand and manage the dependencies and relationships between these functions. It is not just enough to manage them individually but to manage them in an integrated way as part of a total solution approach. How you can better understand the impact and dependencies between asset, capacity, change, power, energy, and environment is becoming an increasingly important question. So how an organization deals with these problems? What kind of methods, traditional tools, and processes are they using that sometimes require manual efforts which can lead to human error? Is an organization relying on spreadsheets as the most automated tools for data input and reporting? Or the organization has any way of capturing critical information and making the decisions and changes that optimize the data center performance? The growing complexity of data centers only adds to the problem and arises to many such questions. Increased density in data centers makes it more critical to track assets, manage space, and ensure safety is maintained. The addition of new technologies with new capabilities creates more challenges with integration and compatibility. However, there are new areas of opportunity for organizations to drive data center improvements and new tools to exploit them. Worldwide demand for new and more powerful IT-based applications, combined with the economic benefits of consolidation of physical assets, has led to an unprecedented expansion of data centers in both size and density. Limitations of space and power, along with the enormous complexity of managing a larger data center, have given rise to a new category of tools with integrated processes-Data Center Infrastructure Management (DCIM). Using spreadsheets has been an accepted way to track assets, but now, DCIM combines that capability with the added coordination of managing space, power, and cooling. Once properly deployed, a comprehensive DCIM solution provides data center operations managers with clear visibility of all data center assets along with their connectivity and relationships to support infrastructure-networks, copper and fiber cable plants, power chains, and cooling systems. DCIM tools provide data center operations managers with the ability to identify, locate, visualize, and manage all physical data center assets, simply provision new equipment, and confidently plan capacity for future growth and/or consolidation. These tools can also help control energy costs and increase operational efficiency. Gartner predicts that DCIM tools will soon become the mainstream in data centers, growing from 1% penetration in 2010 to 60% in 2014. By concentrating and taking an extra effort towards the step that can help organization to increase the efficiency of data center, they need to be very strict in improving these six key areas to better manage their data centers. Also the timely action on the following aspects along with the key functional areas, the organizations can be rest assured about managing their organizations data center efficiency and address the difficulties involved in managing them. Holistic Approach: Bridge across organizational domains-facilities, networking and systems, filling all functional gaps; used by all data center domains data center infrastructure management software solutions offer data center managers and the management with a powerful new tool for dealing with their facilities, IT and network challenges today and in the future. As a data center manager deploying a DCIM solution they can position themselves and their organization to drive significant operational and cost-saving benefits to your company. © Copyright © 2014. CyberMedia (I) Ltd All rights reserved. Meskipun sudah hampir setengah tahun, sebagian masih valid dan on-track. To enable and enhance the advancements in mobility, cloud computing, social media, and data analytics, the innovations behind the storing of information in enterprise and cloud data centers have moved at an accelerated pace over the last decade. As more and more businesses seek to realize the benefits of the ‘3rd Platform' across more and more applications and data sets, 2014 promises a continuation of the fast and exciting progress for data center storage products, technologies, and architectures. Beyond the hype of ‘big data' the business benefits of data analytics for virtually every industry and business model have been studied and published. With data creation growing at a sustained annual rate of more than 40%, companies are challenged to retain the information that could bring valuable market insights and growth in profits. But whether they've deployed new solutions in their private data centers or turned to public cloud services, industry experts estimate that the shortfall in capacity to store all the data that's created will hit 60% in the coming years. That's a lot of valuable insight just flowing down the drain. At the heart of the challenge is not only the cost of the capacity, but also the cost to operate the data center housing that capacity. With regulatory requirements and long-term cyclical patterns for analytical insights, the operating cost is quickly rising as data longevity stretches out to several years or even a few decades. During this extended lifetime, data needs to be quickly accessed by analytics applications or for compliance purposes, making traditional methods of archiving unsuitable. Overall, the rapid pace of innovation is being driven by three forces. The first is the volume, velocity, value, and longevity of data. The second is the total cost of deploying and operating data center storage systems. The third is the management of the high volume of data and more importantly, the accessibility of data by multiple applications over its extended lifetime. Ambient Data Centers will Breathe Fresh Air to Boost Power Efficiency: It's been estimated that in India the biggest expense when running a data center is power, which accounts for approximately 70% to 80% of the overall cost of running a data center facility. About 60% of this is used to just keeping its lights on, to let its chillers run 24*7 and also to help the servers do not stop running. In addition to focusing on hardware that consumes less power, companies have started building data centers that use unconditioned, outside air for cooling instead of traditional chillers and filtration systems. This has been demonstrated to reduce the power required to cool the data center by 96%. A key enabler to expand the deployment of these ‘ambient' data centers is hardware that is resilient to more hostile levels of temperature, humidity, and dust. To better withstand the elements, expect data center IT system providers to offer more in the way of coated circuit boards and sealed hard drives. When the latter is filled with helium, it provides the added benefit of up to 23% lower power consumption. The Emergence of Cold Storage Systems will Enable Fast Access to More Data at a Lower Cost: Data is only valuable if you can get to the information and knowledge locked inside of it. To address the need to readily access massive amounts of data for analytics or compliance, a new breed of storage systems will provide a new architectural layer with high-density ‘peta-scale' capacities at a cost that falls between traditional disk and tape systems. Energy-efficient designs and adaptive power management can reduce power costs and enhance longevity. Storage-class Memory will Proliferate to Accelerate: When we think of analytics we tend to visualize needles of insight being extracted from mountainous haystacks of historical data. However, real-time analytics and decision automation systems can be even more valuable for industries that are hyper-sensitive to time. These high-performance applications can benefit from shaving millionths of seconds off the time it takes for data to reach central processing units. To meet these needs, storage-class memory (SCM) solutions bring the high-capacity and persistence of flash memory to the CPU through the high-bandwidth PCI Express bus within the server. Until recently, the capacity of these caching modules was limited and had to be dedicated to a particular server and its applications. For 2014, look for a new wave of deployment for SCM solutions that offer several terabytes of capacity per card, which can be pooled and shared across multiple servers and applications. Object Storage Systems will Bring Hyperscale Capacity to the Masses: Along with the rapid growth in data is the burden of installing and managing the capacity to store it and ensure that applications can easily and reliably find the data they need. Public cloud service providers, with their need to scale across millions of users, have led the charge in deploying object-based storage systems as an advancement beyond the file-based storage systems of typical network-attached storage (NAS) solutions. Flash and Hard Disk Drives will Thrive Together: The life of data and storage used to be so simple. Data was created, backed up, and archived. In today's world, data lives an active life for years beyond its creation. During that time, it's accessed by several applications-not just the one that created it. The combination of longevity and activeness forms new demands throughout the data center storage ecosystem. A single resting place from creation through years of cyclical access would either be too expensive or too slow. Luckily, a new generation of solutions, under the category Software Defined Storage 2.0 (SDS 2.0), will emerge in 2014. Through a tight integration of software with pools of storage in multiple tiers along the cost-performance curve, SDS 2.0 solutions will be able to dynamically place data in the most cost-effective tier and cache layer based on its state in the usage cycle. Under this model, the value of performance and capacity, all with automated management and at an optimum cost, promises to reach new heights. Historically, servers and applications have been the stars of the data center. With the volume, velocity, value and longevity of data, however, we're entering an era when data storage is taking over the spotlight as a key enabler for advancements in the data center. It's not that processing the data is easy; it's that data has become the currency of business insight and needs to be stored and readily accessible for companies to fully realize its value. Here's to another exciting year and the dawn of a new age for data center storage. While troubleshooting networks, it is often the process of getting to this root cause that consumes maximum time frame. More often than not, 80% of the troubleshooting time is spent in solving 20% of the problem which revolves around the root cause. RCA or root cause analysis does exactly that by pointing out at why something occured. RCA in OpManager is a single graph view of the events of all the plugins of OpManager. When this happens, the impact that is captured on one of the plugins takes the IT team to the root cause. This is, in other words, a single-graph correlation of the events that happen in your network. 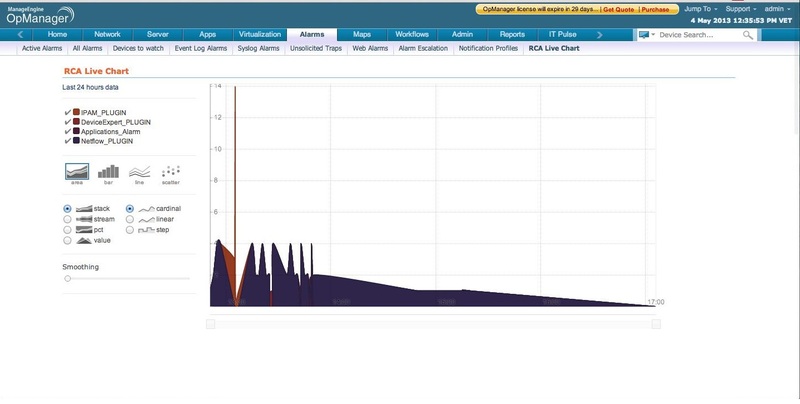 In the OpManager context, RCA is a single graph view of the events of all the plugins of OpManager. When a particular event occurs, the impact it has on the other plugins and their behavior can be easily identified with the help of this graph. The relative dependency between the different plugins across OpManager and the rippling effect that one change can have on the others is brought across as a single graph so that one can zero in on the root cause faster. Let us take an instance where OpManager reports that all the devices connected to a particular switch are down. With this information alone, one can just go ahead and troubleshoot what went wrong with that particular switch. But then, that doesn't really help in understanding what triggered that particular action. It doesn't answer why those devices were down in the first place. Knowing this is important because, there is always a possibility that this can happen again. In order to avoid this from happening again, one needs to know what the root cause of this issue is. By using RCA, it is possible to locate this root cause. A configuration change that was pushed had caused those devices to go down and the Network Configuration Management plugin has the ability to point it out. When this event occurred, a change management alert is triggered in the NCM module exactly at the same time. This is a key learning to the IT administrator and anytime a configuration change is made, he will run a check on the status of devices from next time. There are quite a lot of scenarios that your network will be prone to and having the RCA module helps a great deal in ensuring smooth management of your network. What are the benefits that RCA gives you? All your events associated with the different plugins are brought together in one single screen. By looking at just one place, it is now possible to locate the core reasons for something to go wrong in your network. Troubleshooting gets accelerated because the IT teams can quickly get to the root cause at one glance. This saves nearly 80% of the troubleshooting time and early restoration of services that are dependent on the related devices. When certain configuration changes are made and those changes trigger a chain of undesirable events, the immediate reflex will be to revert those changes. But, at times, this act of reverting the changes can have an even more damaging impact, Until the IT team is sure enough as to what the exact reason is that triggered a particular problem, they cannot act. RCA provides that actionable insight that the IT team needs at that moment. Over a period of time, RCA can potentially help the IT team in establish a standard set of cause and effect relationships between the different elements in the network. When a particular action is to be done, say push a configuration change in the network, the effect could be on the devices and switches. When this is observed to happen frequently, that learning is critical in establishing these cause & effect relationships for certain sets of actions that are part of standard practice. This could further evolve into a set of best practice guidelines for the IT team that makes routine tasks easier & simpler to perform. This is the biggest benefit of all. Any aspect of using a network management tool aims at bringing down downtime of the network. We know that downtime is simply unaffordable and each hour of downtime costs the organization quite a lot. By accelerating troubleshooting, the network is quickly restored to usual state thereby minimizing downtime. RCA module helps in achieving this objective a great deal. Thus, Root Cause Analysis is a highly powerful tool that empowers the IT network administrator thereby helping the entire team save a lot of time and effort in solving network issues.